50+ Ornamental Perennial Grass Seeds - Pampas Grass - "White"!!! Tall Plumes!! Product prices and availability are accurate as of 2019-04-11 09:34:15 EDT and are subject to change. Any price and availability information displayed on http://www.amazon.com/ at the time of purchase will apply to the purchase of this product. 50+ PAMPAS GRASS SEEDS! "WHITE" (CORTADERIA) THESE PAMPAS GRASS SEEDS ARE VERY TINY, LIKE TINY SNIPS OF HAIR, AND CAN EASILY WASH AWAY. SO IT'S BEST TO PLANT WHITE PAMPAS GRASS SEEDS INDOORS ABOUT 6 TO 8 WEEKS BEFORE THE LAST FROST IN YOUR AREA. THEY CAN THEN BE TRANSPLANTED OUTSIDE AT THE APPROPRIATE TIME. THESE WHITE PAMPAS GRASS SEEDS WERE HARVESTED IN 2014 FOR THE 2015 GROWING SEASON. COMES WITH COMPLETE PLANTING & GROWING INSTRUCTIONS! HEIGHT - 7' - 10' SPREAD - UP TO 12' Zones 7 - 10 A FAVORITE OF THE DEEP SOUTH, WHITE PAMPAS GRASS IS USED AS HEDGEROWS OR AS AN EYE-CATCHING CENTERPIECE. PAMPAS GRASS IS A PERENNIAL; IT JUST KEEPS GROWING, OFTEN REACHING HEIGHTS OF 7 TO 10 FEET! THE CLUMPS GET BIGGER EVERY YEAR, AND CAN REACH OVER 12 FEET ACROSS. 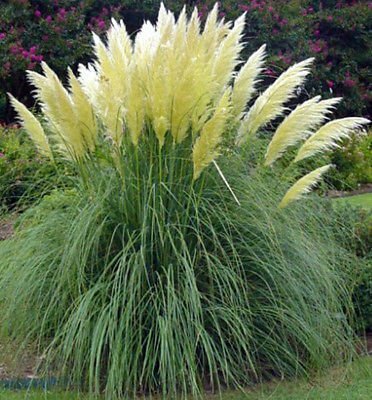 THE PAMPAS GRASS PLANTS HAVE FEATHERY PLUMES THAT APPEAR IN THE LATE SUMMER AND INTO THE FALL. THE PLUMES ARE USED IN DRIED ARRANGEMENTS, BROOM MAKING, AND OTHER CRAFTS. THE LONG GRASS BLADES OF THE PAMPAS GRASS PLANT DROOP DOWN FROM THE CENTER TO DISPLAY THE PLUMES ON TOP. PLANT PAMPAS GRASS SEEDS IN FULL TO PARTIAL SHADE IN MOST ANY SOIL, BUT ADD ORGANIC MATTER TO CLAY SOILS. PAMPAS GRASS IS NOT SUITABLE FOR COLDER NORTHERN LOCATIONS, AS IT IS NOT COLD HARDY AT LOWER TEMPERATURES.